Boil the potatoes in salted water for about seven minutes or until almost cooked. In a large family skillet, melt butter and olive oil together. Add onion, chourico, paprika, garlic powder, and salt. Cook until almost browned. Add potatoes, combine with the chourcio and onion and gently press down a bit. Over medium high heat allow potatoes to brown underneath. 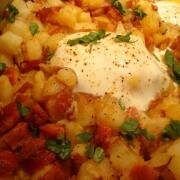 After about five minutes, being careful not to burn the potatoes, crack six eggs over top of your hash. Place on top rack of your oven and broil for about four minutes or until top of potatoes and chourico are browned a bit and the eggs are over easy. Enjoy with crusty bread!